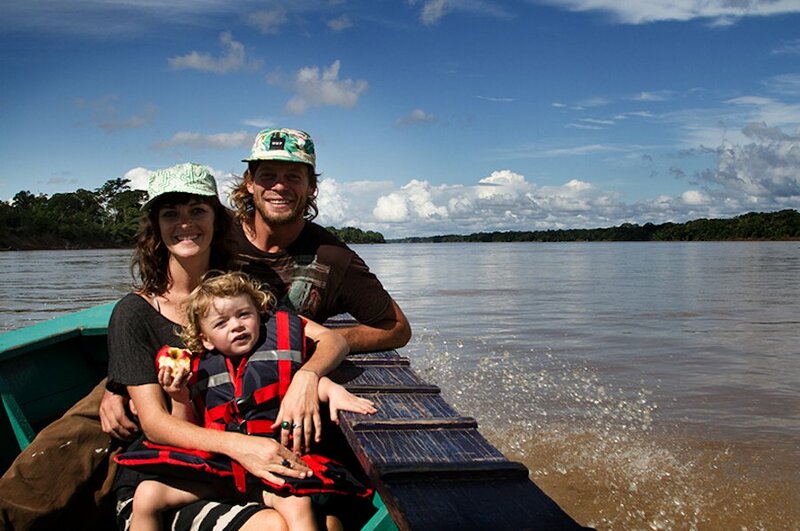 Emily, Adam, and baby Colette on the Amazon River. Photo: Courtesy of . Emily Harteau knows a thing or two about traveling with kids. As we write this, she's driving around the Americas with her husband, Adam, and three-year-old daughter, Colette. Another baby is on the way! You can read all about their tales on . Here's how she high-tails it with a toddler in tow. Before you depart, tell your child where you're going, point it out on a map, talk about the plans — get them excited, too! Make a small family photo album for your little explorer. We call ours a "love book." Print 4x6 pictures of your toddler reading with daddy, cooking with Auntie, and playing ball with cousins. Bring what fits your little one now, not what will fit in six months. There are kids everywhere and that means there are clothes, shoes, and other necessities for them along the road. Bring a stash of surprises — a little bag of stickers or a few small toys — and once a day, week, or month (as needed, really) bust them out. Stock up when you are at a place with good snacks — raisins, granola bars, nuts, a fresh orange — nothing that will (inevitably) get smashed (nectarine, yogurt) into the bottom of your bag. The weather changes as quickly as your toddler's mood. Bring a change of clothes and accessories (sunscreen, a hat, sweater, undies, socks) with you on daily excursions. And make sure your family does too! If you're traveling for an extended period of time, you can make connecting a cinch with the wonderful World Wide Web. Keep a pack within arms reach. Toilet paper is not provided in many bathrooms, sticky faces will need wiping, and spills happen sometimes. You will also relish a quick wipe-down after a long, hot day on the open road. Remember to stay charged and bring spares. I'm a big fan of solar power supply. There will be moments on your voyage that you want to capture and keep for a lifetime. Don't get caught with a dead camera battery! Allot more time than Google Maps or the GPS says it will take to get somewhere. You will need to stop to pee, eat, and stretch. When you pass a playground or park, stop, meet the locals, push your kiddo on the swing, and then continue on your way with a happy munchkin. is a road warrior, camp chef, navigator, fashion designer, wife, and mother. She travels the Americas with her husband Adam, and daughter Colette, in their VW Westfalia. You can follow the trio on and at @ouropenroad. They travel for life.